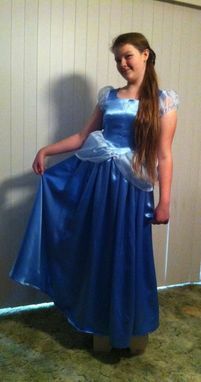 This is a Cinderella costume that I made for the children's theatrical play about 3 weeks ago. It is made with crepe back satin and twinkle for sleeves and flounce. It's a size 14, girls. This is a typical, middle price range costume for a play. The nicer it is made, and with slipping to make it stand out, will make it cost more.